If you like shrimp and grits, the same named dish at the Élevage Restaurant in the Epicurean Hotel in Tampa is the way to go. The shrimp and grits, perfectly prepared, come with pork bellies, one soft egg that you should break and mush around, and bits of pepper and scallion. The result is delicious, high protein-nutritious, and satisfying. 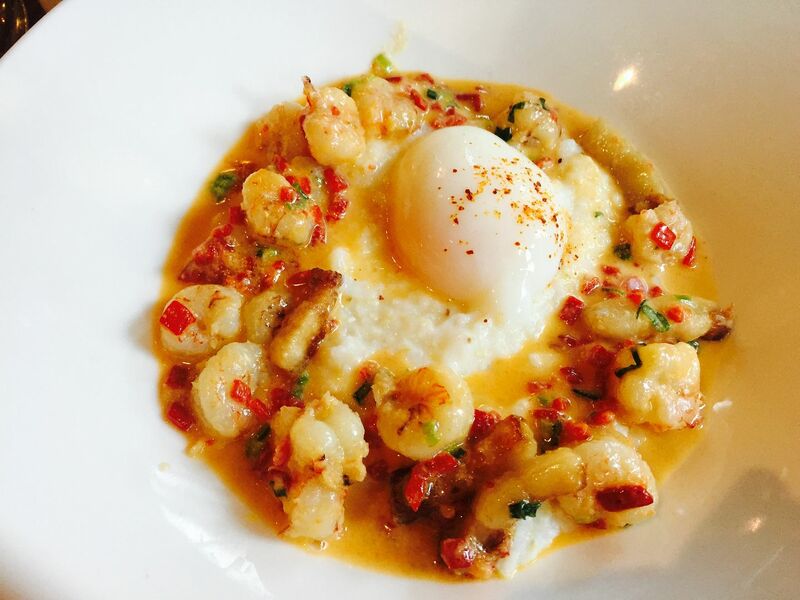 If you have shrimp and grits like this for breakfast, you won't need lunch. If you have this for lunch, you can go light for dinner. I'm usually an oatmeal man for breakfast. Sometimes scrambled eggs. If I had access to the Epicurean every day, all that would change. But I'm back on a plane tomorrow, leaving the shrimp and grits and the summer sunshine behind. Tina and I had a scrumptious dinner last night as the just-opened Slyce, which serves much more than pizza, though you can get that there, too. Slyce is a cosy, cool remake of Ciccone's, next door to Slyce, run by Anthony and Phil Ciccone. The original restaurant was already excellent, but the new rendition in Slyce serves out-of-the-ballpark delicious food. We both started with a strawberry and arugula salad - light and mouthwatering. Tina had the lasagna for her main course, which she loved. I had the veal parmigian. Let me tell you about that. I've had dozens of slightly different veal parmagians over the years, like most devotees of Italian cuisine. But I've never had anything as good as the veal last night in Slyce. It was a veal chop, butterfly cut, and prepared with the perfect tomato sauce was which already a highlight at Chiccone's. The veal was tender, sweet, and plentiful. There lots of other choices on the menu and specials. The paella looked tempting, as did the swordfish, and the four traditional chicken dishes. Lots of good salad options, too. The desserts are probably fabulous, but we were both too full, and, frankly, I wanted the veal parmigan taste going on for as long as possible. At 27 Centre Street in Ardsley, NY, Slyce is well worth the trip is you're in the mood for affordable, outstanding dining or just a quick tasty bite. Last night was the Super Bowl. Yawn. Daughter MVL and I had been talking about making bread pudding some time and last night seemed like the right night to do it while we waited for Downton Abbey. So I emailed her a basic recipe and we tweaked it via gchat as we were parallel-preparing this easy and tasty antidote to the endless winter in our kitchens. It is light and fluffy and seriously delicious - and it makes the house smell divine as it bakes. The quantities are approximate, and you can vary the fresh fruits, breads, spices, dried fruits, substitute maple syrup for the sugar, etc - whatever you have in the house - experiment! Just make sure there's enough liquid to thoroughly soak the bread. You could make a savory version too - I'd keep the apples and add onions, mushrooms, celery - baked stuffing without the turkey. Here is mine this morning - deflated a bit, and not as shiny, but trust me, this is delicious. Preheat oven to 350 degrees, rack at the middle level. Generously grease a 2 quart baking dish with softened butter, all sides, and set aside. In a big bowl, whisk together 3 eggs, 2 tsp vanilla, 1/4 tsp salt, some cinnamon, 1/2 cup sugar - I used light brown granulated because that's what I had. Whisk in 2-1/2 cups milk - preferably whole milk or a combination of half-and-half or cream and 1 or 2% milk - and a container of yogurt. The yogurt is not in the original recipe but I had accidentally opened a vanilla yogurt, so threw it in - would work with any flavor and adds to the creaminess. Add 3 ripe bananas, sliced, and 1/2 cup raisins, and 1 or 2 large cut-up apples into the egg mixture. Fold the bread into the wet ingredients and stir gently but thoroughly. Let stand for at least 10 minutes to allow the bread to absorb the egg mixture. Stir occasionally to assure that the liquid is getting to all of the bread. Pile the mixture into the greased pan, and don't worry if it mounds up - when it bakes it will puff up at least an inch above the pan sides but it comes together and won't spill over, at least ours didn't. You could put the pan on a cookie sheet to be sure there's no mess. Generously dot the top with butter, cinnamon, and a tablespoon of sugar. Bake uncovered at 350 degrees in middle of oven until cake tester or knife comes out clean - at least 60 minutes, maybe 75. Cool a bit and enjoy it warm - with a scoop of ice cream, a drizzle of heavy cream, or just as it is to really get the flavors. Can briefly warm up in the microwave if there are any leftovers - or cold right out of the pan is great too. Hey, I admit to having adventurous dining tastes. Over the years, I've enjoyed venison, bison, mutton, and frog legs. Ok, maybe not that adventurous - certainly not as adventurous as Anthony Bordain - but better than some. I did once try ostrich - cooked at home - and found it too dry. Probably not due to the bird but my overcooking. But when my wife Tina told me about this new place, BareBurger Organic - new for Westchester, NY - that served burgers of wild boar, bison, elk, and, yeah, ostrich, in addition to more conventional fare, I knew I would have to try it. We were on Rt. 119, on our way to another fine establishment, when Tina said hey, how about that new burger place? I hung a sharp turn down Central Avenue. Tina went for the beef burger, organic, and loved it. And I went for the elk. It was just perfect - in many ways like the finest beef burger, but with absolutely none of the fat, not a hint of grease, not even an aftertaste impression of grease. It was just tender, delicious meat, almost fragrant it tasted so good. The brioche and the spinach greens and tomato - also organic - were perfect accompaniment. I was almost sorry I put a little honey mustard dressing into the mix - the elk burger was so savory. There are BareBurgers in Manhattan, New Jersey, who knows where else. If the burgers those serve are anywhere nearly as good as the ones Tina and I had late this afternoon a little south of White Plains - trust me, you'll love it. I may even go for the ostrich next time. Hello, dear readers! It's me, SWVL. Eggplants have been one of my favorite foods since childhood. (I credit this blog's co-proprietor, my beloved mother, for introducing me to the many splendors of these noble purple globes.) I learned how to oven-roast them to perfection a couple of years ago. I've also gotten pretty good, if I may say so myself, at cooking up a simple fresh tomato sauce in the summers. Cue lightbulb: Why not combine these two delightful dinners? I made this recipe last night with all-fresh ingredients from our CSA and the Morningside Park Farmers Market. We served it over whole-wheat spaghetti. Really good! It was even better this afternoon, after we left it in the fridge with the pasta mixed in. If you're not into eggplant (and why not? ), or don't have any handy, you can skip straight to step 5 for a basic tomato sauce. You can also add some chopped green peppers around step 10 instead of the eggplant. Serving suggestion: Goes well with Israeli salad and plum crisp for dessert! Serves two, with plentiful leftovers. 1. Pre-heat oven to 400°. While oven is heating, cut eggplant into roughly one-inch cubes. Leave the skin on. 2. Toss eggplant pieces in a mixing bowl with 2-3 capfuls olive oil (I like the garlic-infused kind) plus a healthy dash of salt and pepper. 3. Spread eggplant pieces in a roasting pan. It's important not to crowd the pan – use two or more roasting pans if needed. Try to put most of the eggplant pieces skin side down. Drizzle a little more olive oil if it looks like any pieces need it. 4. Roast eggplant for ~25 minutes. Check on it halfway through; shake the pieces around the pan a little to make sure they're roasting evenly. When done, take the eggplant out of the oven and put it aside to cool. 5. While the eggplant is roasting, peel and crush the garlic or chop it into little pieces (as small as you can). 6. Heat some olive oil in a French oven type cooking pot; add garlic when the oil is getting hot, and cook at medium heat, stirring often, until garlic is starting to turn golden brown. 7. Peel and dice the onion. Add to the pot when garlic has colored as described above. Add some salt and black pepper. Keep cooking, stirring often, until the onion has turned semi-translucent. 8. Chop the tomatoes into smallish hunks. You can scoop out the tomato seeds if you want, but I don't bother. Try to preserve as much juice as you can. When the onion is ready as described above, add the tomatoes and their juice to the pot. 9. Halve the cherry tomatoes and add them to the pot. Stir well. 10. Squeeze the lemon into the pot; rescue any seeds that fall in. 11. Chop the hot pepper very finely and add to pot if desired. You can also substitute a little crushed red chili pepper if you don't have fresh peppers and want a spicy kick. 12. Cover the pot. Cook at medium-low heat, stirring every so often, until the tomatoes are starting to break down and release their juices (about 10 minutes). 13. Chop the fresh basil. Add basil, a dash of oregano, maybe a little more salt and pepper, and stir well. Cook for another 5-10 minutes, stirring often, as tomatoes break down further and form a sauce. 13. When the sauce has become fully sauce-like, stir in the roasted eggplant pieces. 14. Uncover the pot and cook for another 5 minutes, stirring often, until the eggplant is just starting to fall apart in the sauce. 15. Let cool for about 10 minutes. Serve over warm al dente pasta, or mix the cooked pasta right into the sauce pot. Grate some cheese over the plate if you like. Mmm! I had a top-secret meeting with someone from Google last week, so rather than tell you about what we talked about, I thought I'd tell you about the lunch. It was in the Google cafeteria, some floors up at their New York City office building on 9th Avenue off 15th Street. The food was so good, that "cafeteria" seems an insufficient word for it. So good, that the Google cafeteria reminded me of Justin de Neuve's, also a self-described as a "cafeteria," but one of the best eateries in London, at least when my wife Tina and I had lunch there in 1976 on our honeymoon. The food in Google cafeteria was just a delicious. I had duck, the portions of which came in white bowls with some side veggies and everything cooked to perfection. I saw fish and chicken choices which looked mouth-watering, too. The salad choices were multiple and outstanding, too. I took small portions from at least four, and found the carrots, brocoli, chick peas, and various kinds of lettuce crisp and vibrant. Now, I have no idea how much this costs, because I was a guest. But I didn't see my gracious host pay anything either, so these lunches are apparently a perk for Google's 3500+ employees in New York. And a tasty, healthy perk it is. Google is a wise believer that good food for the palate makes for good food for thought. Checking in with a recommendation for delicious non-caffeinated herbal fruit tea - pineapple mint. I found out about this from my daughter, who's married to Carlos from Brazil. She spent half a year in Brazil a few years ago, and came back raving about this tea (among other things). I don't know how easy it is to get in the U.S. - we found a Brazilian place on Cape Cod a few years ago that stocks a good supply. The company's name is Madrugada. The tea is advertised as "Pineapple Tea w/Mint". I'm in general not a fan for fruit or herbal teas, let alone both, but I find this brew delicious, soothing, and just perfect for a late night cup. It's so good that I don't even feel motivated to find the tea outside of a bag - just put one in boiling water for a few minutes and get a great cup every time. I first had tagliatelle with squid ink - pictured here - at Puttanesca's on 9th Avenue in New York City a few years ago. It was smooth, mouth-watering, like nothing else I'd ever tasted. Hard to precisely describe a taste like nothing else, but squid ink is mildly sassy, low-key salty, and very satisfying. I now order it any time it's on the menu. The sauce, of course, can be made more zesty by the addition of other ingredients. I prefer it as natural as possible. Squid ink not only has a soft taste of the sea, but it has health benefits. At least one study found that it has anti-carcinogenic properties. All kinds of pasta can be made with squid ink. The black ink can take a few days to work through your system, so not to worry. But, trust me, if you're a lover of sea food, you'll order this any time it can be had. Captain Nemo would approve. Ok, this is a food not a music blog, though good food and music go hand-in-hand, but, just to be clear, this is a not a post about Buddy Holly. I just couldn't resist using his name in a post about Sir Cricket's on the Cape (Cod, Route 6, Orleans, MA). On the other hand, you will feel like rock 'n' rolling after having the fried clams, fresh tuna sandwich, just about anything that Sir Cricket's dishes out. Tina and I have been going up to the Cape every summer - sometimes all summer, sometimes just a month or less - since 1982. Our kids - now adults - still think of it as a second home, and now come up with their spouses. 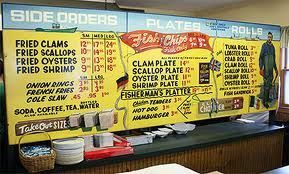 We've loved the food in Cooke's, Captain Elmer's, Cobie's, and other choice Cape fish houses aka joints, and somehow didn't get around to trying Sir Cricket's until last summer (2011). How did we like it? We ate there - at one of the postage-stamp sized handful of tables, or take-out and back to our cottage on the bay - at least half the time we were there. Clams are my favorite kind of seafood anywhere. The steamers at Captain Elmer's are fabulous, but the fried clams - I like 'em with bellies - at Sir Cricket's are even better. Sweet as can be, with a breading that's perfectly slightly crisp and light. The tuna sandwich is stand-out, too. If you never tasted a sandwich made with fresh as opposed to canned tuna, you don't know what you're missing. Sir Cricket's comes on delicious bun - same as the clam roll, and all the other mouth-watering rolls in the place - and is the smoothest, most satisfying little tuna sandwich you'll ever eat. Prices are fine, too. The tuna sandwich goes for an amazingly low seven bucks, and the seafood rolls about thirteen-fourteen dollars. Worth every penny! Anyway ... Pu-Ehr is a black tea, unlike any other, which TeeVoz and I have in the past few months taken to drinking. It almost tastes like some kind of coffee or wine, and it has a smooth, deep, earthy flavor. I drink all black teas with milk - organic, as well as the tea - and milk goes very well with Pu-Ehr, unlike most black ties from China. Honey also complements the flavor nicely, and I'd say it has less caffeine than other black teas, but more than greens and whites. This is not based on chemical analysis, but on how close to going to sleep at night I can drink the tea, and still easily fall asleep. 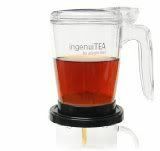 I usually have one cup late in the afternoon or early in the evening - in contrast to other black teas which I drink during the day and rarely after 6pm, and green or white teas, which I usually drink after 6pm. It takes boiling water, like all black teas. Pu-Ehr is said to go back to Ancient China. It is certainly a delicious, calming, clarifying tea for the 21st century. Warm up with cabbage soup! Teevoz checking in after the first big snowstorm of the season in New York! 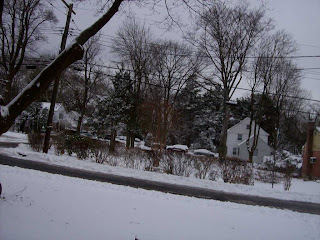 I've always loved the snow. I'm a January baby, and I've long believed that we most love the season we were born in - maybe because it reminds us of birthdays, maybe because of some mystical astrological reason, maybe for no reason at all. I have half a mind to go outside and build a snowman right now, but instead I think I'll share my tweaked version of my dear friend Faith's recipe for cabbage soup that is easy to make and delicious. You can take the extra time to shred your own green and red cabbage and carrots, or you can use a pre-shredded package which, honestly, is just as good and much easier. 1. Heat oil in 6-quart pot over medium heat. Saute beef until browned, about 5-6 minutes. You should saute the beef in small batches so it browns rather than steams. 2. 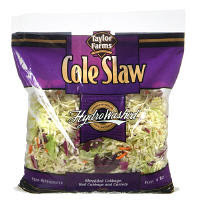 Add coleslaw mix (or shredded cabbage/carrots) and onion; cover and cook for 5 minutes, stirring after about 2 minutes. 3. Add tomatoes, broth, water, brown sugar, lemon juice, and salt/pepper. Bring to a boil. 4. Add rice; reduce heat to medium low/low. Simmer, covered, for 45 minutes or until the rice and beef are tender. NOTE: You can substitute 1/3 cup tubettini or other small pasta for the rice if you like, but since it would need less cooking time than rice, let the cabbage-beef-liquid mixture simmer about 15 minutes before adding the pasta, and then continue cooking for about half an hour. Add a salad, some crusty bread, and - as always - a nice glass of red wine, and you have a perfect warming dinner for a cold winter's night. For those of you who'd like a meatless soup - check out Mark Bittman's wonderful How to Cook Everything Vegetarian: Simple Meatless Recipes for Great Food which has some great ideas for using cabbage in mouth-watering vegetarian soups and all manner of foods! Hello again, Teevoz here .... we haven't forgotten you! I tend to do more cooking in the winter, don't you? Well, we had our first snowfall in New York this weekend, so I thought it was time to share some easy and delicious recipes for the winter with you, our very patient readers. This one, adapted from Giada De Laurentiis, is a seriously easy and incredibly delicious Italian baked pasta and chicken dish that will warm you up on a cold night. Make a salad while it's baking and you'll have dinner on the table in an hour. 1. Cook pasta in a pot of boiling salted water, until al dente - about 5 minutes. Drain and put in large mixing bowl with a little butter or olive oil so it doesn't stick together. 2. Cut chicken into cubes and saute in olive oil, about 3 to 5 minutes. 3. Add onion and garlic to chicken, continue to saute until onion is soft and chicken is cooked through, about 5 minutes more. Don't let the garlic get too brown or it will be bitter. 4. Add chicken mixture to the pasta and mix together with the tomatoes and their juice, mozzarella cheese, tomato sauce, parmesan cheese and basil or parsley. Salt and pepper to taste. Add extra tomato sauce and/or some diced fresh tomatoes if needed - the mixture should be moist. 5. Transfer the pasta mixture to a buttered 8x8x2 baking dish. Cover the top with the bread crumb-parmesan mixture and generously dot the top with butter. Bake in 400 degree oven for about 30 to 40 minutes, until the top forms a golden brown crust. Serve with salad and a nice red wine - and enjoy! A bialy is, well, better than a bagel, even when bagels in New York were made by the original H & H, and other great bagel makers, and were out of this world. But the bialy ... that was something out of the stratosphere, light like a flying saucer, just baked, not boiled, and if the bagel was deliciously chewy, the bialy was ... well, light, yeah, with a white powder all over and shreds of onion in the middle... the unbearable lightness of being bialy. It got its name from Białystok, Poland - also of Max Bialystock fame - but I always thought that the bialy also maybe had something to do with White Russia. As a kid, I would take a bialy over a bagel seven out of ten times (only kidding, I didn't really keep track), and they were always mouth watering. And they still were until not that long ago, too. 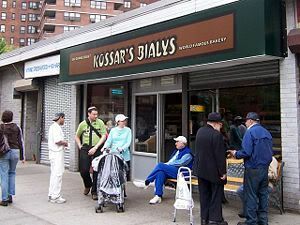 My wife Tina and I would take the kids down to Kossar's at Grand and Essex, on the lower East Side, for late-night bialy runs. We'd buy a few dozen, and they were all but gone by the time we'd made the 40-minute ride back home. They were nowhere as good the next day, but they toasted up pretty well. It's a good thing I write time travel stories - maybe I can figure out a way to get some character back to Grand and Essex, say, even just 5-10 years ago. Or, you can try Mimi Sheraton's fine book, The Bialy Eaters: The Story of a Bread and a Lost World. Hello everyone - I'm Tina Vozick, aka teevoz - Paul and I have been together since 1968, married since 1976. (I was, of course, a child bride.) Our two kids, now grown, will attest that he knows a lot about food, but other than toast, a boiled egg, and chicken nuggets, he's really not the one you want to cook for the family. So I'll be chiming in from time to time here with some recipes and other thoughts about food, broadly interpreted. I'll start with a great recipe. We have some lactose-intolerant family members, so a few Thanksgivings ago I was looking for a non-dairy recipe for pumpkin pie, and found this gem - now it's my recommendation for anyone who wants a smooth and creamy treat, easy to make, whether or not you can eat dairy products. I think it's even better than traditional pumpkin pie recipes. I use a store-bought 10” graham cracker crust, the one that says “2 extra slices” – if you use a 9” graham cracker crust you’ll have a little filling left over that you can do in individual small graham cracker crusts. Or you can make a crumb crust yourself - or if you're really adventurous, a pastry crust. I'm not that adventurous, and the graham cracker crust is delicious. 1. In a large bowl, mix sugar, cinnamon, salt, ginger, nutmeg, and cloves. Add pumpkin, soy milk, maple syrup and eggs; whisk until well blended - by hand or electric beater. Pour mixture into crust in pan. 2. Set pie on bottom rack of a pre-heated 425° regular (not microwave!) oven. Bake for 15 minutes, then reduce temperature to 350°; continue baking until center of pie is just set, about 40 minutes longer. The center should be set, but still jiggle when you give it a shake. To keep the pie from overcooking or the crust burning, turn off the oven, open it, but leave the pie inside to cool: it will continue to cook. After about 20 minutes, take it out of the oven to finish cooling. 3. Set pie on a rack until cool, at least 2 hours. After serving, chill the rest of the pie, airtight, if there's any left. I never have this problem. You could serve it with a dollop of whipped cream on top if you need the dairy fix. Don't worry if the top of the pie cracks - it always does. But if you're the type of neatnik who wants an uncracked top, try this tip - my daughter said she read that if you put a pan of hot water at the bottom of the oven on a rack below your pie, the steam allows the pie to stay moist while it still cooks and will prevent the cracking. I must say, I'm both skeptical and unsure of why anyone cares if the pie cracks, but give it a whirl and let me know if it works! I should also mention that you don't have to slavishly follow the quantities - especially the spices and the amount of sugar - you can adjust it to your taste. This is a pretty forgiving recipe, my favorite kind. I know, it's not Thanksgiving. But trust me, you'll love this pie any time of year, and it is fast and easy to boot. Bon appetit... and let me know here how it comes out! You've probably heard that pretzels were invented by a monk in the early dark ages - to reward children for learning their lessons - and fashioned to symbolize arms folded in prayer. But there's no real proof of that, and besides, that's not the reason I love pretzels. As with all things food and drink, for me to key inducement is they taste great and/or are good for you, in some combination. 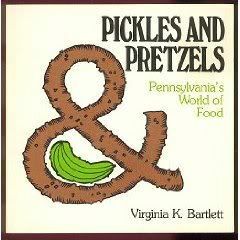 Now, I like my popcorn and potato chips, too, and will probably be posting little reflections on them, here, sooner or later, but the the fact that I'm writing about pretzels first may tell you something. And of all the many pretzels, there is one kind that I hold high above all others: the Pennsylvania Dutch extra dark, with low sodium, if possible. The Dutch actually is comes from Deutch, as in German, and with Pennsylvania in front of it we're talking about the Amish and their brethen who live near Lancaster, as well as Ohio and other places with farms. My family and I have had more than a handful of unique, once-in-a-lifetime food from that area - strawberries that we picked, apricots which had just been picked from a nearby tree - these were the best we ever ate, and remind me to write about them, if I don't soon. We first saw the dark PA Dutch pretzels in the Bird-in-Hand Farmer's Market a few miles east of Lancaster. We loved them, bought at least a dozen bags to bring back home to New York, and did that for several years, increasing the number of bags each time. That Farmer's Market is open all year around, and also has some great cheeses and other goodies, and one or two times we even drove there in the winter to get our pretzels. But the bag I have in front of me was purchased in a Mrs. Green's on Central Avenue in Westchester. It's not the same company that made the Bird-in-Hand bags - this one is "Happy Herbert's" - but the pretzels are just as good. Crisp, the surface has the just the right resistance, and the inside tastes and feels just right on your tongue. So good, you won't even want to dilute the experience by putting the pretzel in a dip. Plus, they're great for watching your favorite television, which can be good for you, too. I first sipped Blueberry Port at a science fiction convention - I-Con, held at SUNY's Stony Brook campus on Long Island, New York - in 2004. Duck Walk Vineyards, a little down the road on Montauk Highway in Southampton, was hosting a tasting, and I knew as soon as I saw that dark blue wine in a glass that I would really like it. I'm partial to anything blueberry - probably stems from the time my father and I went out picking wild blueberries near our bungalow in Monticello, New York, and we got lost and didn't get back home until well after dark. This was a pretty big deal and worry for my mother in age before cell phones, but the blueberries we ate for lunch and dinner out in the thicket were the best I've ever had. Sweet, and, now I know, teeming with anti-oxidants. Port, on the other hand, is usually a slowly acquired taste. "Fortified" is the word used to denote its invigoration with brandy - which stops the fermentation, increases the alcohol content, and retains sugar. This kind of wine, which gets its name from the Portuguese city of Porto on the sea, can be a little overpowering when made from grapes. But not when it's made from blueberries. It's not cheap. Duck Walk charges $12.95 or more for 375ml, half the size of a bottle of wine. But the blueberries are handpicked in the wild in Maine... You can pour the port over ice cream, or just sip it on its own. And, hey, wouldn't you like to be able to say to someone who comes over your place, next time, "Care for a glass of port?" I first became impressed with Papaya King - to the point of thinking it served the best non-alcoholic drink in town - back in the late 1960s, when I was writing the songs that would become Twice Upon a Rhyme with Ed Fox over at his place on York Avenue and East 85th Street in New York. Papaya King was on the corner of East 86th Street and 3rd Avenue, and its "papaya drink," advertised in hilarious, garish signs as being a cure for whatever ailed you, was just delicious. It contained some kind of papaya juice, and probably a little pineapple, orange, and who knows what else, in a frothy mix that tasted out of this world, if you drank it right after you bought it. If you brought some home and drank it the next day, it just tasted run-of-the-mill good. The signage, in addition to the elan vital claims for helping your digestion, was also not to be believed. FDR was said to have come up with the idea of the New Deal after drinking a papaya from Papaya King - which had opened (as Hawaiian Tropical Fruits) in 1932, so the timing was right - and even Lyndon Johnson's endorsement was on the wall, which, given my opposition to the Vietnam War, was not too persuasive. And if Presidents current and past were not enough, the Beatles were said to have visited Papaya King in 1965 before their appearance on Ed Sullivan, plus a sign proclaimed that Papaya King's hot dog was "Tastier than Filet Mignon." By the late 1990s, I had conveyed the lore of the papaya drink to my wife and our kids, but we tended to be on West more than East Side of New York, which brought us to Gray's Papaya on 72nd Street and Broadway. Gray's Papaya had started as a copy of Papaya King in 1972, and by the 1990s it was certainly giving Papaya King a run for its money. Debates still froth about which has the better papaya drink. I'm reasonably sure that Gray's tastes a tiny bit more marvelous at first, but Papaya King's sits a little better a few minutes later. But I could have it reversed, and everyone who has tried papayas at both has their own opinions. The signage at Gray's certainly is not as wild as at Papaya King's, but Gray's does have its endorsement of Barack Obama in March 2008 going for it - though it hasn't yet claimed that that's where Obama got his idea for the New New Deal. Gray's does have a winning sensitivity to economic hard times and the need they engender for cheap, tasty lunches - and dinners - and has been offering its "Recession Special" of two hot dogs and a papaya for years. It's now up to $4.45, still a good deal, but was recently $3.50, and with so many millionaires now out of work, one hopes Gray's sees the light and lowers its price to at least its previous level. The store recently has seemed to be perpetually under reconstruction, but that's a venerable New York City tradition - see the Bruckner Expressway, not to mention the Second Avenue subway, which actually was never constructed in the first place. If I were to tell you that I sometimes think the music playing in Trader Joe's is better than the food, believe me, that would only be a very high compliment about the music, because the food is superb. A few days ago, I heard the Four Season's Ronnie and the Beau Brummels' Laugh Laugh in the Trader Joe's on Central Avenue in Westchester - I'd say it's been decades since I heard either song anywhere, including on WCBS-FM, the great oldies station in New York. 1. Chicken Drumettes ... boneless white chicken meat, already cooked, no preservatives, no artificial ingredients ... about 20 pieces - 3 is certainly enough for lunch and even a light dinner. Melts in your mouth. 2. Pomegranate Green Tea ... 64 ounces of tea, kettle brewed from green tea leaves, pomegranate juice, pear and eldeberry juice ... the cane sugar ingredient is not overwhelming (15 grams per serving) ... Delicious. The first two are just a few dollars each. The trail mix can be a little more, depending on the size of the package. A few things to beware of ... Not every item in the store is organic. Some of the nuts and dried fruits have sugar added. Some of the ready-to-eat dinners have a lot of sodium. So, in all cases, read the labels carefully, as you would in any store. But the main problem with Trader Joe's is that the store is sometimes - well, often - out of stock, on one or more great items. They run out of items at the warehouse, temporarily discontinue them, then bring them back. (This happened this past summer with the Pomegranate Green Tea.) The remedy for this is stock up whenever you can, and/or go to the store often. Well, aside from not working very well in winter - unless you're a member of the Polar Bear Club, which is another story - what you can get to eat in a Japanese sushi restaurant, whether raw fish or seaweed, is a lot more tasty. In fact, sushi is my favorite food. But sushi is a cold, sweet, salty protein rush. Not everyone likes it - but it's a lot more than you can get, mouth open, at the shore. A significant joy of sushi is the vinegared rice, which not only tastes great but keeps the fish fresh. And of course the mix of fish could never swim up on any single shore. Sushi comes in pieces and various kinds of rolls. Each piece is a mini-food pyramid, with protein (fish), carbs (rice), and vegetable (seaweed). If you order piece by piece, you can easily control how much you eat, even better than with Chinese dim sum and Spanish tapas. Your high school fitness teacher should have loved it. My wife introduced me to sushi back in the 1970s. Her boss loved it (he lived to a ripe old age). Now I actually eat more more sushi than she does. White tuna: I get it whenever I can. It's much more vibrant than any regular tuna, including Yellow Tail, which is quite good. Well, that's more than enough dinner for me. I included the soft-shell crab not only because it's delicious but because it's cooked. Most sushi shrimp, unlike the raw Ebi, is cooked, too. These are good entry morsels into the world of sushi, if you're squeamish about eating fish raw. But, look, lox is raw, and you've probably eaten some of that at one time or another. Tuna sushi is just lox's next-door neighbor. Miso soup, made from soy, is a good way to start - the darker the better. Edamame - soy beans in their pods, boiled or steamed - is a scrumptious and very healthy appetizer. Green tea is great to sip with sushi. Plum wine is fine, and sake is smooth and transcendental. If you have room for dessert, I'd go with red-bean ice cream. I should mention that Jeremy Piven - Entourage's Ari Gold - was recently diagnosed with mercury poisoning, and tuna sushi may be implicated. But he ate it twice a day, and it's not clear at this point whether the sushi, Chinese herbs he also consumed, or both are to blame. Whatever the case, consuming too much of anything can make you ill - people die every year of water poisoning. Much as I love sushi, I'd stay with the twice a month to twice a week at most mode - never twice a day, every day. I don't know if Aristotle ate raw fish, but he was right in his principle of moderation, at least when it comes to food.